This show was amazing, blew me away with what could be done with stitchery, and inspired lots of thoughts about "drawing" with stitches. The coolest band around and an awesome friend. This is just so cool on so many levels, political metaphor or art. Leave it to the Dutch. 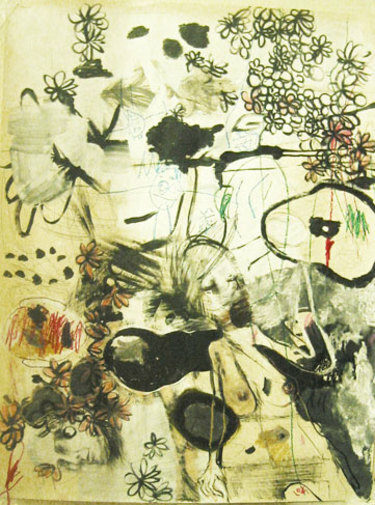 Although mostly known for his paintings, he has a few smaller pieces and drawings that are quite amazing. Mark-maker extraordinaire. He just makes me want to draw and draw and draw. 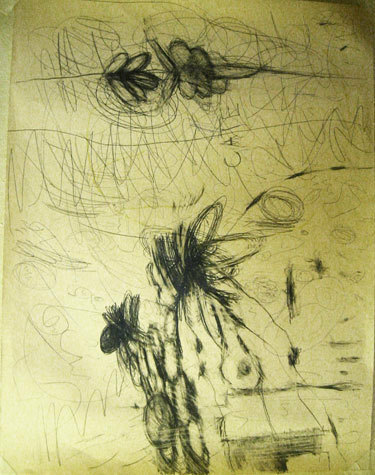 One of the great abstract expressionists. Here is my progress with the Love Song lyrics. 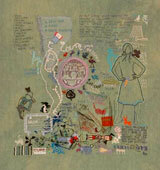 Lots of scribbles and stitches via extremely mixed media. Hope to be doing my cruel black lady proud. I have been given the unique opportunity to artistically represent my talented friend's lyrics for her single Love Song. She has been asked by numerous fans for the lyrics and quite wisely she has decided to refrain from putting them on the web and instead wants to make their distribution into an art project. So I have been asked to scribble and stitch them by hand. We will eventually scan them or photograph them and put them in a book. This project is right up my alley and gives me a concrete thing I need to accomplish in a set amount of time. What's better is that the lyrics fit perfectly with my current state of mind. A love song, but not really, because it has a twist and is more like an angst song or irony song, as is usually the case with "love" anyway. Here's a little tidbit of the song. And also a little inspiration piece for the scribbling. When in Philly, it is always wise to visit the Mütter Museum, especially if you have a taste for the macabre, bizarre side-show-like vintage medical displays or are endlessly fascinated by jars of dead babies. 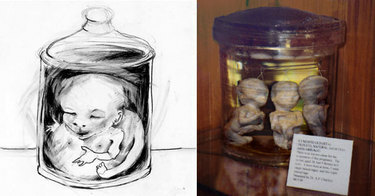 Visiting the Mutter took me back to a time in my life when I couldn’t get enough of drawing body parts and baby parts suspended in jars. Those were my first years studying art at Cooper Union and also my first years in New York. I remember I was reading Geek Love at the time with its sad, yet fascinating tale of a freakish circus family and their relentless pursuit of creating the most deformed babies they could possibly create for the sake of furthering their sideshow. Back then I liked the idea of exploring something that could be simultaneously disturbing yet clinical. I also liked it as metaphor for how disconnected I was feeling in this strange new city full of people. But now, as I stared into those jars with those distinct little faces with their tiny, hairy eyebrows I couldn’t help but think of my own beautifully formed child and the overwhelming feeling of suspended possibility that exists as this potential life grows inside you. I was reminded of how absurd it is that so much is left to chance, and that the creation of life, while miraculous and full of possibility, is also alarmingly mundane. Here’s a sketch I did on the left with a photo from the Mutter Museum on the right. Layer two of the Sept. 17th post could well be on its way to being a big confusing mess, especially with two artists at work (one of which likes to climb on top of the other). There are certain small parts I want to take and isolate, and a figure is emerging in the lower right, but overall its getting way too mucked-up, pieces-parts. I could take gesso to the whole thing, which is actually kinda fun. Or start fresh. And I did tell Cate it was probably time we each had our own special piece of paper just for ourselves. I picked up some of my old copies of New American Paintings to get a little inspiration. As I flipped through the pages, I realized more and more the pieces I was attracted to had faces, and the faces I liked were usually drawn in pencil. I do not like overly representational life-like paintings, because the result is usually boring and more about the fact that the artist can make paint look like something that it isn't. The greatest artists in my book are those that could get past that human desire to be representational at all times and instead be honest about their medium. A little representation is good. When it's all thats there, it's not good. In recent years, I had shyed away from drawing faces for fear of being schmaltzy or illustrative. I instead focused on marks. But as I flipped through those books tonight, I realized that this was all an act of fear. Back when I was being most honest about what I wanted to make, I let the faces make their way unapologetically onto the paper. In fact, I was so compelled to draw faces because they float around in my head. Not particular people I know, but complete strangers. Strangers faces. I used to draw them all the time and it was mostly a way to get them the hell out of my head, release them back to wherever they wanted to go. So tonight I return, though a sheepish start, to letting the faces free. 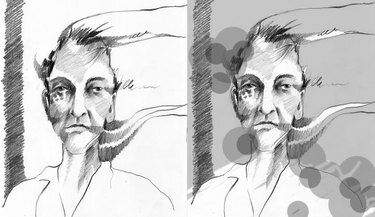 The image on the left is the original drawing and the one on the right has some digital additions. Couldn't decide which version I liked more, so here's both. Last Saturday, at the end of a particularly crappy week on the work and emotional front, the scribble project is born. Here's the result: the first layer. The plan is to keep it on the wall and keep adding layers. I hung a 30" x 40" press sheet on the wall at toddler height so my little angel, Cate, could help with scribbles. I get to sit on the floor and jam the crap out of the graphite until the paper is shiny black, then I get to erase it. Put it on, take it away, put it on, take it away, put it on, take it away. Cate was only too happy to get into this. After about 30 minutes of furious scribbling she stopped, turned to me and said "Mama, I love you when you're drawing." Me too, kid.